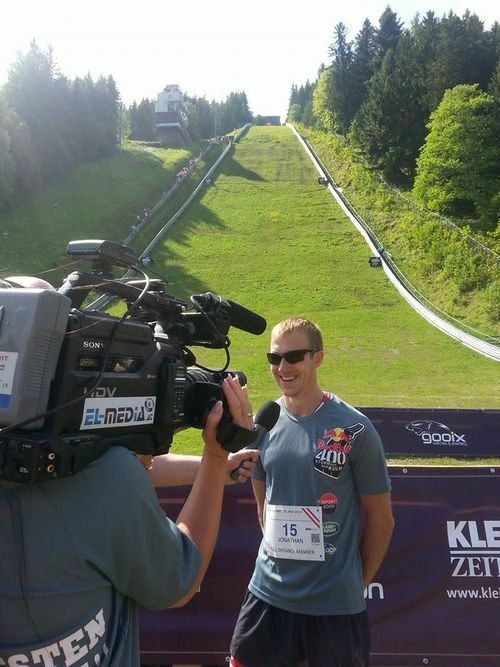 With RedBull being renowned for holding some of the most extreme sporting events around, it came as no surprise to hear that they hold the steepest running race in the world! At just 400m it sounds more like a sprint until you learn the winners do it in around the 5 minutes. 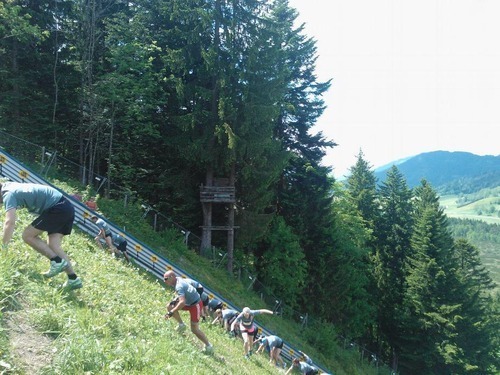 Held on an Austrian ski jump the average gradient is something in the region of 70%, with runners starting at the bottom and finishing at the top… it’s that simple. 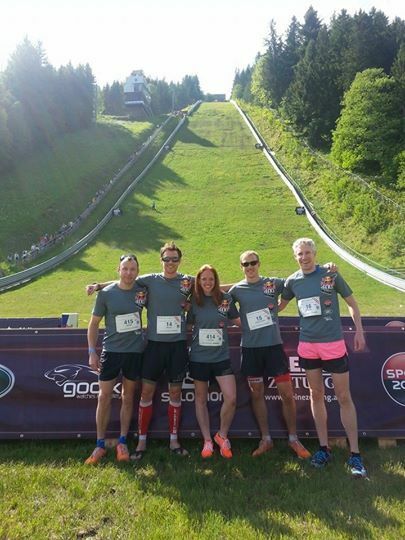 I was travelling out for the weekend with inov-8 OCR and friends; it was the first time I’ve been to Austria and I have to say it is one of the most beautiful places I have visited. Driving from the airport in Salzburg we were all stunned by the scenery. We arrived a day early so had time to relax, take in the sights and soak up the sun… Ross even organised a mini OCR for everyone. 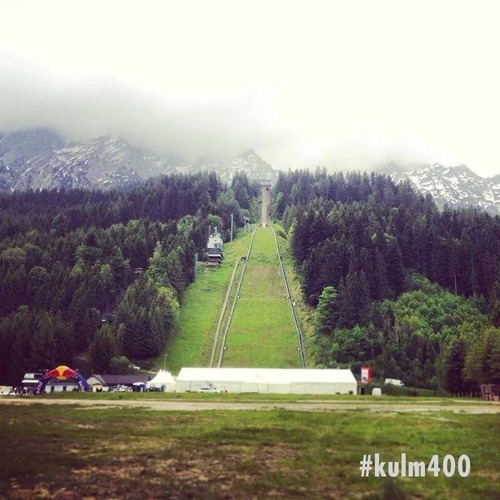 As we arrived on Sunday for the race just about everyone was swearing when we got our first glimpse of the ski jump. 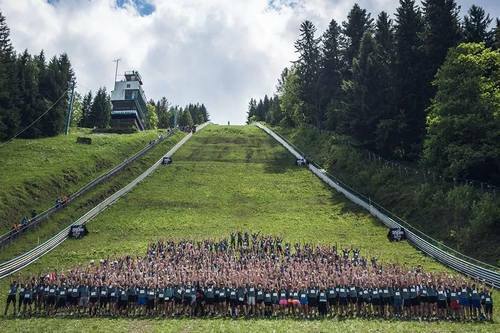 The hill is in two sections; the first, a grassy slope with the steepest section at 79%, the second is the ski jump itself, a concrete ramp at about 70%. The men were to run in heats in order to qualify for either the A or the B final. The heats were to the top of the grassy slope (about 260m) and the finals to the very top (400m). I was in heat 1 and therefore first to run from our small contingent. Considering this was going to be the shortest race I have ever competed in (by far), I didn’t know what expectations to have. After a small warm up I took my place on the start line and waited for the countdown, the gun sounded and we were off! After about 30m I found myself up front; it was hard work but I was surprised at how easily I was leading so slowed my effort to just stay in front of second place by a couple of meters. I got into a nice rhythm just putting one foot in front of the other reaching the top in 3 minutes, the exertion had taken its toll with my legs and lungs burning but I felt I had more to give and had won my heat comfortably. Jogging back down the mountain I could hear the next heat getting under way and started to think whether I really wanted to do it again; even at a reduced speed the ascent was pretty painful! Once at the bottom I sat in a cold stream for 5 minutes thinking it would help my legs recover, grabbed some food and tried to relax as it would be another 4 hours till the finals got underway. Ross also made the A final and Adam just missed out by 0.1seconds so qualified for the B final instead. The ladies didn’t have to do heats so Clare was already set to compete in the afternoon. She looked a bit apprehensive as she got underway but soon got her game face on and smashed up finishing in an immense second place. Lining up for the final I had no idea what to think, I was standing next to Ross and we were both smiling even though we knew the amount of pain we would be in shortly. The gun sounded and we were off again, trying to mimic my pace from the qualifying heat I put my head down and started powering up the slope. Having watched some of the other competitors in the heats I opted to use more of a bear crawl technique in the final. This felt fast and before I knew it I was leading again and had a big smile on my face. After the first 150m it started to get hard, at 200m something switched in me that said ‘ease up now, pace yourself’…thinking back this was the start of the end for me and once a couple of people passed me things started to go downhill, fast. We reached the top of the grassy slope where we had finished in the morning heats and I was in third. We started up the ramp to the ski slope and what followed are some of the most painful minutes of my life, it was all I could do to put one foot in front of the other and slowly claw my way up getting slower and slower. My legs had nothing, my mind was trying to propel them up but all I could take was what felt like baby steps as a steady stream of competitors overtook me. I heard people screaming my name but nothing registered, I could feel the heat of the sun beating down onto my back and I just wanted it to be over. Without caring about the race, my position or anything else in life I just wanted to reach the top and collapse. Slowly I was getting there, within a meter someone dived in front of me to steal one more position, I didn’t care, all that I thought was ‘you’re in my way and I want to die in the shade’. I crawled over the line and it was over. Never have I deteriorated so quickly in a race. 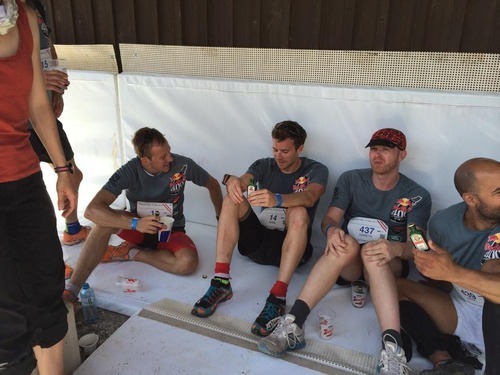 Ross soon joined me in the shade and I could tell he was also glad it was over; before I knew it we were surrounded by friends all ready to get the after party underway and celebrate the completion of one of the shortest and most sadistic races we had ever entered. 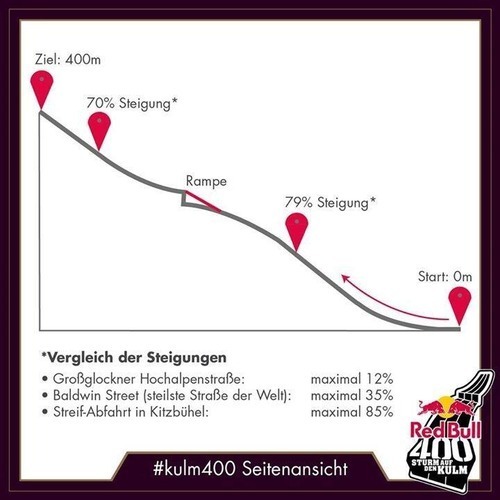 Thinking back, if the race had been the same distance as in the morning I would have paced myself perfectly…this left me with nothing for the ski jump. There are probably many studies that could explain what happened to me talking about lactic acid and thresholds etc. but I just couldn’t maintain that pace, for that long, on that steep a slope. It’s easy to criticise myself and say I paced it terribly but without having done it before it’s not exactly an easy science. In the end I crossed the line in 13th place, I never expected to win but felt my fitness levels warranted being in the top 10. I’m not disappointed in my effort because I pushed myself over the edge and still carried on to finish but I am disappointed in how I paced myself. I definitely think to have taken part before is a huge advantage and I’m sure we will be back next year to face old demons and with an even bigger UK party. Talking with Ross on the drive back to Salzburg we laughed at the fact I have run many long hard races and never ‘hit the wall’ but seem to have done just that after 260m in a 400m race. The weekend was immense fun and I learnt a lot from the race. A painful race is always good for training as well… the thought of being in that much pain again will always make you push harder in training so it doesn’t happen again. Having let the entry for the Marathon Des Sables 2015 pass me by I have now decided to enter into the Dragons Back 2015, an equally hard multi stage running race in Wales. In order to gain entry I will have to complete a few more ultra marathons before September, therefore I have entered into a 35 miler next weekend and the ’10 Peaks’ at the end of June, set in the Lake District this will be a 75 km self navigation ultra… wish me luck!